by Dr. Racho Donef � Sydney, Australia. 2003. After the Assyrian genocide and the expulsion of the remaining Assyrians in the Ottoman Empire, the Assyrian delegation in Lausanne made some effort to convince the Turkish delegation to let the Assyrian resettle in their homeland in Hakkari. The Turkish delegation stubbornly rejected these approaches. Having rid itself of an ethnic element was not interested in repopulating parts of Anatolia with Christian population, whether indigenous or not. The Lausanne telegraphs published by the Turkish Historical Society contain all the telegraphs sent between the Turkish delegation in Lausanne and the Turkish Government in Ankara. The telegraphs reveal the resolve of the Turkish delegation not to entertain any thoughts of an Assyrian homeland. The following two telegraphs best document this attitude. 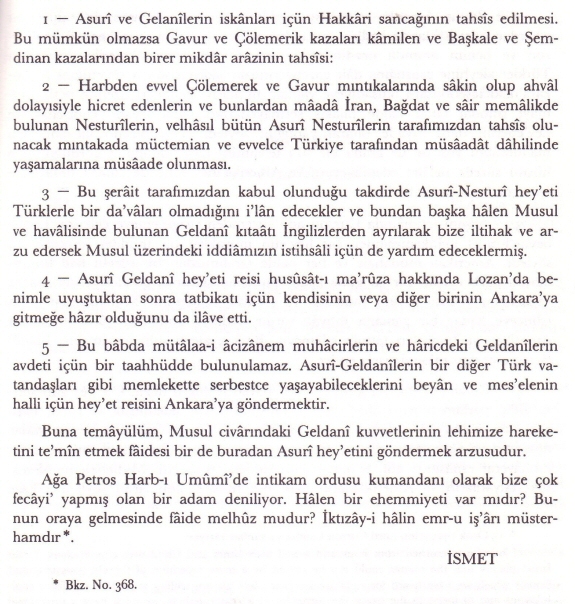 Document 1 � Cable sent from Ismet Inönü, head of the Turkish delegation in Lausanne, to the Turkish government. To grant the sanjak  of Hakkari for the settlement of the Assyrian and Chaldean population. If this were not possible then to grant the entire Gavur or Cölemerik districts, as well as some parts of Baskale and Semdinan. He asked for the return [of the Assyrian Nestorians] who lived in Cölemerik and Gavur before the war and who migrated because of the situation; and in addition those Nestorians who are in Iran, Baghdad and other countries, in short all of the Assyrians and Nestorians, to return and live all together and under the facilitation of Turkey. In the event that this condition were accepted, then the Assyrian-Nestorian delegation will declare that they have no claims against [issues with] Turkey. Furthermore, the Chaldeans who live in Mosul would ask for Mosul to be annexed to Turkey and that they would help us to achieve this end. The head of the Assyrian Chaldean delegation also added that once we reach agreement in Lausanne they are prepared for him or someone else to travel to Ankara. Accordingly, we cannot make any commitments about the return of the helpless refugees and other Chaldeans living abroad. The Assyrian-Chaldeans can live in Turkey freely like other Turkish citizens. We can send the head of the delegation to Ankara to declare this. To this end, I wish that we send an Assyrian delegation from here to ensure that the Chaldean troops in Mosul work for our interests. 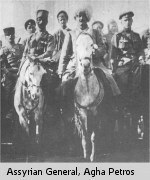 It is said that during the General War Agha Petros, as a commander of the army of revenge, caused much damage to us. Does he still have authority? Is it possible for him to come? I request in writing that the order is carried out. 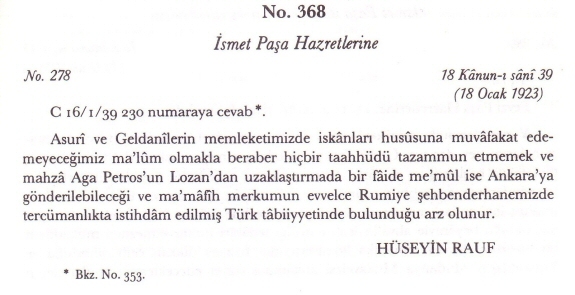 Document 2 � Cable sent by the Turkish Prime Minister Hüseyýn Rauf to Ismet Inönü. It is obvious that we would not approve the settlement of Assyrians and Chaldeans in our country. However, as long as we do not make any commitments and if it is beneficial to send Agha Petros away from Lausanne he could be sent to Ankara and we inform you that said person was an interpreter in our Urmia Consulate and has Turkish citizenship. 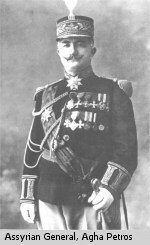 B Simsir, Lozan telegraflari, Vol. 2, Türk Tarih Kurumu, Ankara, 1994. Armenian, Assyrian and Hellenic Genocide News.